Food intake is particularly controlled by the hypothalamus and involves homeostatic and hedonic pathways [1,2]. Impairment in nutrient sensing pathways in the hypothalamus has been found to induce obesity . Several neuroendocrine hormones especially ghrelin regulate food intake through an effect on the hypothalamus . Ghrelin is the primary gut orexigenic signal that is involved in short and long-term regulation of appetite principally via acting on the hypothalamus [5,6] and can enhance food intake in both animals and humans [7,8]. There is some evidence that showing dopamine (DA) neurotransmission also can exert a regulatory effect on food intake [9,10]. For example, DA-deficient mice exhibited behaviors associated with seeking and ingesting food, but they could not consume food enough to survive . Additionally, the DA antagonists caused serious feeding deficits in animals [12,13]. The dopamine D2 receptors have been shown to predominantly mediate the regulatory effect of the DA on food intake [14-16] within several specific sites of the hypothalamus including ventromedial nucleus [17,18]. However, whether modifying effect of hypothalamic dopamine receptor activity on energy homeostasis and appetite behaviours is mediated by regulation of ghrelin concentration is unknown. Interestingly, previous studies demonstrated that activation of the D2 receptor significantly reduces both basal and stimulated plasma leptin levels in human and rats, suggesting D2 receptor neurotransmission mediates energy balance via regulating leptin levels [19,20]. Although the precise mechanism(s) of hypothalamic dopaminergic regulation of energy homeostasis by peripheral homeostatic modulators is (are) unknown, it seems that normal functioning of dopamine receptors in the brain play an important role in the maintenance of normal eating behavior and in the regulation of energy balance through physiological state associated hormones (i.e., hunger and satiety hormones). Since, there is no adequate data in literature about a relationship between D2 receptor activation and ghrelin level, therefore in this study; we investigated the existence of a possible correlation between plasma levels of ghrelin and hypothalamic D2 receptors in ventromedial nucleus of the hypothalamus in rats. Together, our results showed that there is a potential interaction between the dopaminergic transmission in hypothalamus and appetiteregulating hormones that likely depend on vagal cholinergic pathway. Quinpirole hydrochloride (dopamine D2 receptors agonist), Sulpiride (dopamine D2 receptors antagonist) and atropine sulfate monohydrate (cholinergic antagonist) were purchased from Sigma (St Louis, MO, USA). After 1 week of habituation to the housing conditions, for cannulation and verification of placement, rats were deeply anesthetized with chlorate hydrate (400 mg/kg; i.p.) and fitted with a 23-gauge stainless steel cannula placed just above the right ventromedial hypothalamic (VMH). Stereotaxic coordinates were determined from the rat brain atlas of Paxinos and Watson; VMH, lateral: +0.7 mm from midline; dorsoventral: 8.5 mm from skull surface; anteroposterior: - 2.4 mm from the bregma . The injector extended 1 mm beyond the end of the guide cannula. After surgery, the animals were allowed a 5-day recovery period before experimental trials. 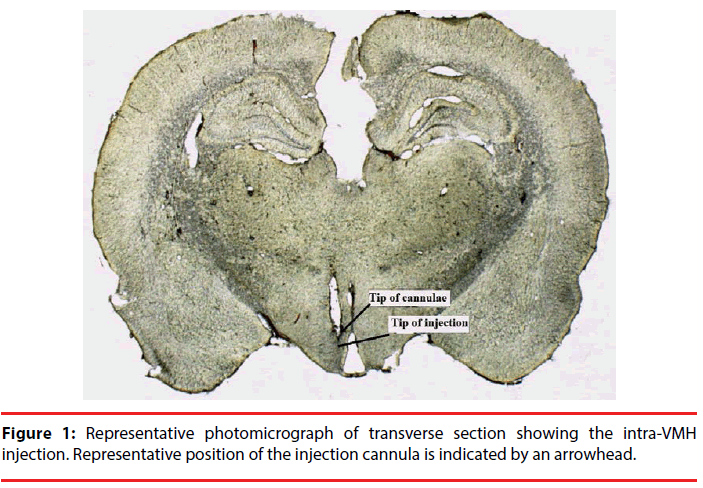 Placement of cannula in the VMH was confirmed after experiment by fixation of brains in formalin and then 100 μm thick sections were taken and cannula and injection tracks were examined with light microscopy. Only data obtained in rats verifying histologically the placements of cannula were used (Figure 1). The total number of injected rats in the VMH was 36 (each group; n=6). Five rats were excluded due to cannula misplacement. Injection of compound drugs or saline was performed under chlorate hydrate anesthesia using a Hamilton 1 µl syringe through silastic tubing in a volume of 0.5 µl over 30 s. After the injection, the needle was left in place for an additional 30 s.
Figure 1: Representative photomicrograph of transverse section showing the intra-VMH injection. Representative position of the injection cannula is indicated by an arrowhead. In a first and second set of experiments, we considered the effects of VMH -microinjected Quinpirole (D2 receptor agonist) and Sulpiride (D2 receptor antagonist) on plasma concentration of ghrelin. In the first set of experiments, rats in control and treatment groups, received an effective dose of D2 receptor agonist, Quinpirole (0.5µg), and antagonist, Sulpiride (0.005 µg) or saline (0.5 µl) into the VMH, respectively, after a 20-h fasting period. The effective dose of D2 receptor agonist and antagonist was based on that used in other study in our lab (data not published). To investigate the time-course effect of the VMH injection of drugs; blood sampling was performed at 0, 10, 20, 40 and 60 min after drugs injection. Basal blood sampling (0 min) was immediately followed by the VMH injection and then at 10, 20, 40 and 60 min after the injection, blood samples were collected. For protection of blood samples against ghrelin degradation, coated tubes with protease inhibitors were used. Tail blood sampling technique was used to collect blood (at the amount of 500 µl) from the rats around 9:30 AM on the fasted day. In the second set of experiments, we studied the role of the vagus nerve in the regulation of hypothalamic D2 receptors-mediated energy homeostasis. Rats were pre-treated with subcutaneous (s.c.) injection of atropine or saline, and 30 min later D2 receptor agonist, Quinpirole, and antagonist, Sulpiride, at doses of 0.5µg and 0.005 µg or saline (0.5 µl) was administered into VMH. Blood samples were collected at 0, 10, 20, 40 and 60 min after the drug injections for determination of hormone secretion output. After blood sampling, plasma ghrelin was measured using rat ghrelin EISA kit with intra-assay precision CV<10% (Zellbio Company ELISA kit-Germany). All experiments were performed at 9:30 AM. Results are shown as mean ± SEM. The differences between groups in the hormone study were checked by repeated measures analysis of variance (ANOVA) (time course analysis of ghrelin), one-way ANOVA followed by Turkey’s HSD test (hormone analysis at one time). Student’s paired t-test was used to evaluate differences between two points in one group. P<0.05 was considered statistically significant. In the present study, we evaluated whether modifying effect of hypothalamic D2 receptors on energy homeostasis can be mediated through the regulation of ghrelin secretion (probably mediated by vagal pathway). To do this, the effective doses of D2 receptor agonist and antagonist were selected and examined. The ghrelin secretion pattern over time (a period of 1 h) was evaluated following microinjection of Quinpirole (0. 5 µg) into the VMH. As shown in Figure 2A, plasma ghrelin level was significantly changed in different groups [F (4, 24) = 9.273, P<0.00]. Further analysis revealed a significant increase (p<0.001) in plasma ghrelin from the basal levels of ~100% to 181% at 10 min and to 187% at 60 min, compared with saline injection (Figure 2B). Moreover, the application of Sulpiride significantly decreased (p<0.01) plasma ghrelin from the basal levels of ~100% to 65% at 40 min and to 51% at 60 min, compared with saline injection (basal level: 1191.61 ± 49.92; at 10 min: 1140.55 ± 97.50 and at 60 min: 1228.79 ± 73.38, Figure 2A). Sulpiride injection had no significant effect on ghrelin concentration at time of 10 (106%) and at 20 min (96%) (Figure 2B) compared with saline treated rats. Figure 2: Effect of VMH injection of the D2 receptor Agonist (Quinpirole; 0.5 μg) and D2 receptor antagonist (Sulpiride; 0.005 μg) on plasma ghrelin concentrations in 20-h fasted rats. A: the ghrelin secretion pattern over time (a period of 1 h) following microinjection of Saline, Quinpirole (0.5 μg) and Sulpiride (0.005 μg) into the VMH. B: Comparative time-dependent ghrelin concentration changes as percentage between groups (n=6). Each point represents mean ± SEM. ***: P<0.001 and **: P<0. 01 compared with VMH saline-injected controls. We also examined the possibility that the vagal cholinergic pathway might be implicated in the stimulation of ghrelin secretion by VMH injection of Quinpirole. As shown in Figure 3A, atropine injection in 20-h fasted rats, significantly changed plasma ghrelin levels in different groups [F (4, 24) = 4.53, P<0.00]. Further analysis revealed a significant decrease (p<0.00) in plasma ghrelin from the basal levels of 1204.01 ± 21 pg/dl to 357 ± 70.75 (Figure 3A) (31%; Figure 3B) at 10 min, and to 361.59 ± 11 pg/dl (Figure 3A) (32 %; Figure 3B) at 60 min compared with control group. Increased ghrelin level by Quinpirole was prevented by atropine pretreatment (Fig. 3A). Figure 3: Effect of atropine pretreatment (1 mg s.c. at time point -30 min) on plasma ghrelin concentrations in control and drugs groups (D2 receptor agonist /antagonist) of 20-h fasted rats. A: Time course of plasma ghrelin concentrations in control and drugs groups B: Comparative time-dependent ghrelin concentration changes as percentage between groups (n=6). Each point represents mean ±SEM. ***: P<0.001 and **: P<0. 01 compared with VMH saline-injected controls. Plasma ghrelin concentration fluctuates with feeding status (i.e., hunger vs. satiety). Existing literature demonstrates the ghrelin action on regulation of both normal and cue-driven feeding through the midbrain dopaminergic system. Ghrelin and hunger state augment dopamine release, thereby increasing food seeking behaviour [22-24]. Moreover, cueassociated dopamine release has been shown to trigger ghrelin release and increase its plasma level . However, it is unknown whether the hypothalamic dopamine projections would physiologically affect homeostatic regulators of energy including ghrelin? Normal function of dopaminergic neurotransmission has been shown to be essential for feeding and survival . It is now clear that any abnormality involving the dopaminergic system will be reflected by changes in feeding behavior. Pervious pharmacological studies demonstrated that dopamine D2 agonists inhibit food intake by the action on hypothalamic neuropeptide Y. It has also been observed that D1 and D2 receptors synergize to inhibit feeding in healthy and diabetic rats and that a combination of D1/D2 receptor agonists are needed to alleviate obesity . In contrast, adult Drd2-/- mice (D2R knockout mice), hypothalamic low D2 receptor expression and D2 receptor blockade by Sulpiride or antipsychotics were associated with a hyperphagic response that were found only in obese rats [15,27]. This supports the idea that abnormal dopaminergic transmission is involved in the pathogenesis of hyperphagia during obesity. Even though the hypophagic effects of dopamine receptor agonists have been characterized, it has been reported that Quinpirole (D2-like receptor agonist) administration produces a complex behavioral effect, decreasing palatable food consumption while it enhances the ingestion of standard food in rats . Also Salimi, et al. observed that activation of D2 receptors of paraventricular nucleus (PVN) increases food intake and intra-PVN microinjection of sulpiride decreases food intake by blocking D2 receptors in this area . Taken together, increasing studies demonstrated that modulation of the hypothalamic dopamine receptor activity induced significant changes on food intake [17,9,10,12,28,30,31]. Nevertheless, the mechanism by which hypothalamic dopaminergic pathways control energy balance remains as an open question. It seems that metabolic circuit, especially variations in hyperphagic or hyporphagic peripheral signals play a critical role in the regulation of eating behavior . In this regard, in the present study, we investigated whether modifying effect of the hypothalamic D2 receptors on energy balance may be mediated through the regulation of ghrelin secretion. We provide in this work first evidence for an important role of the hypothalamic dopamine signaling in the regulation of ghrelin plasma levels via the connection in which activation of D2 receptors in the VMH increases ghrelin concentration. We also found that the stimulatory effect of dopamine D2 receptors on plasma ghrelin concentration is markedly blocked by the pretreatment with atropine. The metabolic role of the dopaminergic system and its interaction with ghrelin has been reported in previous studies [24,33-35]. The importance of this interaction in the energy control center is highlighted by a co-localization of growth hormone secretagouge receptore-1A and D2 receptors in the hypothalamus . Actually, a significant point of our study is the fact that dopamine has a role outside of the classical pathway in which it regulates ghrelin level possibly via a two-way link between dopamine signaling and ghrelin. Hypothalamic regions implicated in ghrelin signaling, lateral and ventromedial hypothalamic nuclei as well as arcuate nucleus, form neurocircuits with the reward pathways that is likely to be important in integrating feeding control . Tracing studies show that neurons in the ventral tegmental area (VTA) receive projections from hypothalamus and infusion of ghrelin into the lateral hypothalamus or directly into regions related to pleasure, reward and motivation stimulates VTA neurons, causing release of dopamine . Also, DA projections to hypothalamus are implicated in homeostatic regulation of food intake. These data establish a physiological role of hypothalamic dopamine signaling in stimulating ghrelin secretion. Nevertheless, future studies are needed to elucidate which hypothalamic neuronal populations and neurotransmitters are involved in ghrelin secretion. The vagovagal circuitry within the dorsal vagal complex (DVC) via descending inputs from the lateral hypothalamus, PVN, VMH, and arcuate nuclei constitutes the primary means whereby higher centers exert a direct influence over gastrointestinal function [37-40]. Furthermore, the ventromedial hypothalamus elicits anorexigenic and orexigenic signals to paraventricular nucleus and lateral hypothalamic nucleus, and then lateral hypothalamic nucleus exerts a direct pathway to dorsal motor nucleus. These lead to efferent output via the dorsal motor nucleus of the vagus, which activates the vagus nerve to store energy [32,39]. In this context, we found the possibility that dopamine-containing projections to the DVC may also play a role in the central regulation of ghrelin release. This is based on the fact that administration of D2 receptor agonist induced a vagal cholinergic-dependent increase in plasma ghrelin levels and peripheral pretreatment of atropine markedly suppressed this effect. A relationship between vagus nerve activity and ghrelin release has also been reported in previous studies. For example, it has been demonstrated that the rise of ghrelin levels in fasted condition is mediated via the vagal nerve connections to the stomach mucosa . Hosoda, et al. and Williams, et al. reported that vagal-induced elevation of plasma ghrelin in fasting completely is suppressed by subdiaphragmatic vagotomy or atropine pretreatment, and this result was mimicked by treatment with the atropine [42,43]. More directly, cholinergic agonists or antagonists increase or reduce circulating ghrelin levels in humans, respectively [44,45]. Additionally, vagal-cholinergic (muscarinic) activation can stimulate gastric ghrelin gene expression and ghrelin secretion . Since in the present study, atropine was peripherally injected, acetylcholine receptors in other regions modulating appetite and perhaps in reward centers of brain might also be involved in the regulation of ghrelin secretion. For example, there are few data that reveal muscarinic acetylcholine receptors (M3 receptors) in the hypothalamus are mainly targets for obesity and food intake. The lack of M3 receptors have been reported to protect against some forms of obesity as well as to ameliorate impairments in glucose and energy homeostasis [47,48]. Furthermore, the blockade of muscarinic acetylcholine receptors in the ventral tegmental area could disrupt food-related learning in rats . Together, our results suggest that the hypothalamic dopamine signaling might follow a mechanism through which vagal outflow to the gastric system is increased and results in enhanced ghrelin secretion, although further studies are needed to assess the mechanism (s) involved in the hypothalamic dopamine regulation of food intake. Collectively, these findings suggest that dopamine is a physiological regulator of ghrelin release and support the role of hypothalamic dopaminevagal efferent activation in stimulating ghrelin secretion. It also seems that dopamine signaling, cholinergic pathway and ghrelin secretion make a straight pathway and any point blockade of the pathway may interrupt orexigenic action of the hypothalamic dopamine. This work was supported by the Isfahan University of Medical Sciences, Isfahan, Iran [Grant No. 194071, 2015]. The funders had no role in study design, data collection and analysis, decision to publish, or preparation of the manuscript. Blouet C, Schwartz GJ. Hypothalamic nutrient sensing in the control of energy homeostasis. Behav. Brain. Res 209(1), 1-12 (2010). Morton GJ. Central nervous system control of food intake and body weight. Nature 443(7109), 289-295 (2006). He W, Lam TK, Obici S, et al. Molecular disruption of hypothalamic nutrient sensing induces obesity. Nat. Neurosci 9(2), 227-233 (2006). Lenard NR, Berthoud HR. Central and Peripheral Regulation of Food Intake and Physical Activity: Pathways and Genes. J. Obes 16(S3), 11-22 (2008). Cummings DE. Ghrelin and the short- and long-term regulation of appetite and body weight. Physiol. Behav 89(1), 71-84 (2006). Müller TD, Nogueiras R, Andermann ML, et al. Ghrelin. Mol. Metab 4(6), 6437-6460 (2015). Egecioglu E, Jerlhag E, Salomé N, et al. Ghrelin increases intake of rewarding food in rodents. Addict. Biol 15(3), 304-311 (2010). Wren AM, Seal LJ, Cohen MA, et al. Ghrelin enhances appetite and increases food intake in humans. Clin. Endocrinol 86(12), 5992 (2001). Meguid MM, Fetissov SO, Varma M, et al. Hypothalamic dopamine and serotonin in the regulation of food intake. Nutr 16(10), 843-857 (2000). Volkow ND, Wang GJ, Baler RD. Reward, dopamine and the control of food intake: implications for obesity. Trends. Cogn. Sci 15(1), 37-46 (2011). Zhou QY, Palmiter RD. Dopamine-deficient mice are severely hypoactive, adipsic and aphagic. Cell 83(7), 1197-209 (1995). Clifton PG, Rusk IN, Cooper SJ. Effects of dopamine D1 and dopamine D2 antagonists on the free feeding and drinking patterns of rats. Behav. Neurosci 105(2), 272-281 (1991). Sink KS, Vemuri VK, Olszewska T, et al. Cannabinoid CB1 antagonists and dopamine antagonists produce different effects on a task involving response allocation and effort-related choice in food-seeking behavior. Psychopharmacol 196(4), 565-574 (2008). Yoon YR, Baik JH. Melanocortin 4 Receptor and Dopamine D2 Receptor Expression in Brain Areas Involved in Food Intake. Endocrinol. Metab 30(4), 576-583 (2015). Ja-Hyun Baik. Dopamine signaling in food addiction: role of dopamine D2 receptors. BMB. Rep 46(11), 519-526 (2013). Fetissov SO, Meguid MM, Sato T, et al. Expression of dopaminergic receptors in the hypothalamus of lean and obese Zucker rats and food intake. Am. J. Physiol. Regul. Integr. Comp. Physiol 2834(4), 905-910 (2002). Mansour A, Meador-Woodruff J, Bunzow J, et al. Localization of dopamine D2 receptor mRNA and D1 and D2 receptor binding in the rat brain and pituitary: an in situ hybridization-receptor autoradiographic analysis. Neurosci 10(8), 2587-2600 (1990). Kok P, Roelfsema F, Frölich M, et al. Activation of dopamine D2 receptors lowers circadian leptin concentrations in obese women. Clin. Endocrinol. Metab 91(8), 3236-3240 (2006). Mastronardi CA, Yu WH, Srivastava VK, et al. Lipopolysaccharide- induced leptin release is neurally controlled. Proc. Nat. Acad. Sci 98(25), 14720-14725 (2001). Paxinos G, Watson C. The rat brain in stereotaxic coordinates. Hard Cover Edition. Academic Press (2007). Cone JJ, Roitman JD, Roitman MF. Ghrelin regulates phasic dopamine and nucleus accumbens signaling evoked by food-predictive stimuli. Neurochem 133(6), 844-856 (2015). Abizaid A, Liu ZW, Andrews ZB, et al. Ghrelin modulates the activity and synaptic input organization of midbrain dopamine neurons while promoting appetite. Clin. Invest 116(12), 3229-3239 (2006). Cummings DE, Frayo RS, Marmonier C, et al. Plasma ghrelin levels and hunger scores in humans initiating meals voluntarily without time- and food-related cues. Am. J. Physiol. Endocrinol. Metab 287(2), 297-304 (2004). Szczypka MS, Rainey MA, Palmiter RD. Dopamine is required for hyperphagia in Lep(ob/ob) mice. Nat. Genet 25(1), 102-104(2000). Rusk IN, Cooper SJ. Parametric studies of selective D1 or D2 antagonists: effects on appetitive and feeding behaviour. Behav. Pharmacol 5(6), 615-622(1994). Correll CU, Malhotra AK. Pharmacogenetics of antipsychotic-induced weight gain. Psychopharmacology (Berl) 174(4), 477-489 (2004). Cooper SJ, Naser HA. Dopaminergic control of food choice: contrasting effects of SKF 38393 and quinpirole on high-palatability food preference in the rat. Neuropharmacol 50(8), 953-963 (2006). Salimi M, Eliassi A, Haghparast A.Intra-paraventricular nucleus microinjection of D2 receptors antagonist, sulpiride, reduces food intake in 24 hours food-deprived rats. Ir. J. Physiol. Pharmacol 1(3), 193-186(2015). Bina KG, Cincotta AH. Dopaminergic agonists normalize elevated hypothalamic neuropeptide Y and corticotropin-releasing hormone, body weight gain, and hyperglycemia in ob/ob mice. Neuroendocrinol 71(1), 68-78 (2000). Kuo DY. Co-administration of dopamine D1 and D2 agonists additively decreases daily food intake, body weight and hypothalamic neuropeptide Y level in rats. Biomed. Sci 9(2), 126-132 (2002). Lustig RH. The Neuroendocrine Control of Energy Balance. Freemark M, editor.Contemporary Endocrinology: Pediatric Obesity: Etiology, Pathogenesis, and Treatment. New York: Springer, 15-32 (2010). Skibicka KP, Dickson SL. Ghrelin and food reward: the story of potential underlying substrates. Peptides 32(11), 2265-2273 (2011). Menzies JR, Skibicka KP, Leng G, et al. Ghrelin, Reward and Motivation. Endocr. Dev 25(1), 101-111(2013). Perello M, Dickson SL. Ghrelin signaling on food reward: a salient link between the gut and the mesolimbic system. Neuroendocrinol 27(6), 424-434 (2015). Kern A, Grande C, Smith RG. Apo-ghrelin receptor (apo-GHSR1a) regulates dopamine signaling in the brain. Front. Endocrinol 5(1), 1-8 (2014). Ter Horst GJ, Luiten PGM, Kuipers F. Descending pathways from hypothalamus to dorsal motor vagus and ambiguus nuclei in the rat. Auton. Nerv. Syst 11(1), 59-75 (1984). Wu X, Gao J, Yan J, et al. Hypothalamus-brain stem circuitry responsible for vagal efferent signaling to the pancreas evoked by hypoglycemia in rat. Neurophysiol 91(4), 1734-1747 (2004). Verberne AJM, Sabetghadam A, Korim WS. Neural pathways that control the glucose counterregulatory response. Front. Neurosci 8(1), 38 (2014). Bernardis LL, Bellinger LL. The lateral hypothalamic area revisited: ingestive behavior. Neurosci. Biobehav. Rev 20(2), 189-287 (1996). Sugino T, Yamaura J, Yamagishi M, et al. Involvement of cholinergic neurons in the regulation of the ghrelin secretory response to feeding in sheep. Biochem. Biophys. Res. Commun 304(2), 308-312 (2003). Hosoda H, Kangawa K. The autonomic nervous system regulates gastric ghrelin secretion in rats. Regul. Pept 146(1-3), 12-18 (2008). Williams DL, Grill HJ, Cummings DE, et al. Vagotomy dissociates short- and long-term controls of circulating ghrelin. Endocrinol 144(12), 5184-5187 (2003). Broglio F, Gottero C, Van KP, et al. Acetylcholine regulates ghrelin secretion in humans. Clin. Endocrinol. Metab 89(5), 2429-2433 (2004). Maier C, Schaller G, Buranyi B, et al. The cholinergic system controls ghrelin release and ghrelin-induced growth hormone release in humans. Clin. Endocrinol. Metab 89(9), 4729-4733 (2004). Maier C, Ried M, Vila G, et al. Cholinergic Regulation of Ghrelin and Peptide YY Release May Be Impaired in Obesity. Diabetes 57(9), 2332-2340 (2008). Maresca A, Supuran CT. Muscarinic acetylcholine receptors as therapeutic targets for obesity. Expert. Opin. Ther. Targets 12(9), 1167-1175 (2008). Yamada M, Miyakawa T, Duttaroy A, et al. Mice lacking the M3 muscarinic acetylcholine receptor are hypophagic and lean. Nature 410(6825), 207-212 (2001). Sharf R, Ranaldi R. Blockade of muscarinic acetylcholine receptors in the ventral tegmental area disrupts food-related learning in rats. Psychopharmacol 184(1), 87-94 (2006).